Great race by Ham and Kimi. Ham deserved it. winner of the 1000th race sounds good. Kimi nicely passed same cars twice with a better strat he would finished in front of perez.. They didn't throw him under the bus. Vettel looked faster and it was obvious Charles was not making any progress on the car ahead, so why not shake things up and see what Vettel could do before the Mercedes disappeared into the distance? It's funny as you take a very driver-centric approach to your F1 viewing. I take a team view. I love Ferrari and have no interest in specific drivers, per se. I want the team to do well, not specific drivers. I can agree that they put Vettel in front when he looked to be faster. However, in all fairness they should have let Leclerc back in front when it was obvious Vettel was neither gaining on Bottas or pulling away from Leclerc. They also screwed Leclerc's strategy. 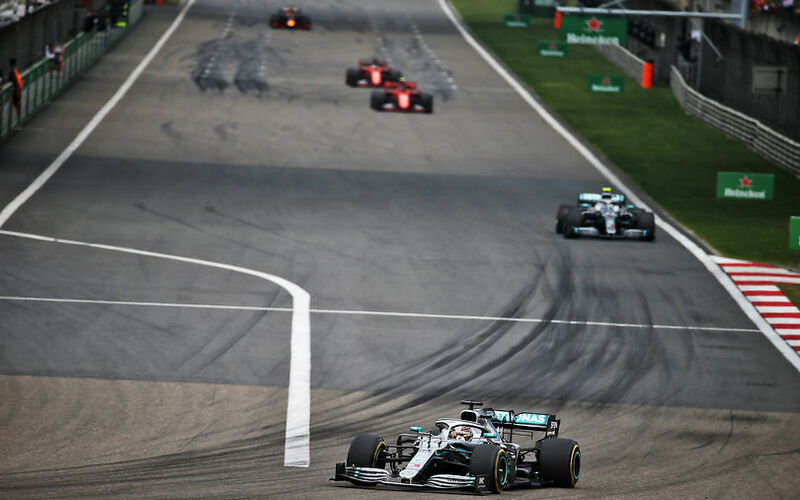 Now Verstappen would always have had a good chance on fourth spot, but Leclerc did not even have a fighting chance because he was used to try to hold up Bottas, which did not lead to anything either. Everyone here can respect the team view, if the decisions are in favour of the team view. In my personal view, this has lead to potential points loss to Verstappen, and also created frustration with Leclerc. The team didn't exactly benefit. The team also made 3 decisions in the first 3 races in favour of one single driver. People should be forgiven if they look at that and take a driver-centric approach, because the team itself doesn't do itself favours on that one. Indeed and as such the team will have nobody to blame but themselves if Leclerc just says ‘NO’ next time he’s asked to move over. Looking at the lap times for the race. Why is it that after the Leclerc/Vettel swap, the lap times increase? Vettel was keeping up with Leclerc all the time he was behind, then once he is through he slows down, I don't get why. Tyres? From a team point of view, the swap certainly seemed to be the right thing to do, they were falling behind the Mercs, but the swap only made this gap worse. He had DRS on the straights, every straight. As soon as he lost that his time evaporated. Yeah, I also think most of the time Vettel sat behind Charles, Charles was about 2-2.5 seconds behind Bottas, in turbulent air without the DRS. It was only when Charles appeared to be fighting his case on the team radio when they dropped to about 3 seconds back. Then with Seb in front it quickly became 7+ seconds. I think switching was right maybe a lap or 2 later, but once it was clear Seb had no pace, they shuld have putted Leclerc before Max, or even pitted Vettel first. I don't want to paint Ferrari as "the bad guys" like that either. They have their own rational reasons and the switch at the time was logical. Vettel was faster at that point in time. But they should switched back when it was clear Vettel was not making inroads. It is too early in the season to put such burdens on the team. Good thing is: Leclerc is a good, humble and patient person. He will be able to put the decisions in context, but he will also defy team orders when the occasion is right, like in Bahrain. Ferrari has to respect he is not a walkover, and that Leclerc's patience should also be rewarded. The fun part is that Vettel wasn't any faster. He possibly actually was slower, and his continuous tire locking didn't help much either. Then Red Bull happened and they had no way to actually defend their drivers against that, especially when holding Leclerc out for that much longer. They then used Leclerc to hold up a Bottas who they were never able to hold up to begin with. Ferrari promoted a WDC capable driver to play second fiddle to a driver who's sole achievements for the past 9 months were a few spins and throwing away the WDC challenge. They are throwing Leclerc under the bus, especially when knowing Leclerc has actually been faster so far this season. I'm all for the team thing, but then they should at least try to make it work, which they do not. Also, the first race of the season isn't really the place for team orders, nor is the second or third. They have a perfect example on how it works in Mercedes last year. I never figured that team orders were a thing you could mess up. Verstappen must be laughing his what-nots off. I did wonder if the Ferrari boys would start tearing lumps out of each other (points wise). I thought Hamilton would be the benefactor though. Looking at these five examples, and why they worked and why the became epic drama has more to do with how the leading driver reacts to his successor and how the team is managing them and their challenge. I hope that Vettel will use his knowledge of F1 history to take his right path, because for Piquet, Prost and Alonso it didn't reflect terrible well on their careers. I know he's not the most popular person out here, but in times like these, Ferrari needs someone like Niki Lauda to sit down with Vettel and talk tactics. Last year Ferrari were blamed that they allowed Kimi too much freedom (did not support Vettel enough) on almost every occasion. Now they do commit to Vettel fully (as they stated even before the season started) and they again catch flak for it. Sure Leclerc is fast, maybe even slightly faster then Vettel. It is very possible, he is a very big talent but Ferrari said they would be supporting Vettel and now they are doing that. Leclerc is already challenging that at every opportunity, not just via his racing but very much also via his politics. He is constantly on the radio, his interviews, Ferrari needs to explain it to him. Those are imho the team politics at work, Leclerc is trying to force the team in giving him Nr. 1 (or equal for now) status whilst the team wanted to back Vettel in this (Leclerc's first year). To me Leclerc is not that super humble guy at all (nor does he need to be) but I feel it strange that such statements get made. To me it is clear he is going fro Nr.1 status as fast as possible and all out. F.e. also in the race when they let Vettel past, He was putting (he then had DRS) so much pressure on Vettel that Seb had 3 lock ups (costing him his tires) but Leclerc was also pushing on his own absolute limit for that as he had at least one lock up that I saw televised himself (costing him his tires as well). That is not the driving of a humble nr. 2 but indeed one of a young gun trying to force the team into making it his. We don't watch your video because we get "due to a copyright claim by the content owner.". -> You re-upload video. Totally agree , but I had to laugh at "young Nigel was challenging" Was Mansell ever young ? He must have been about Hamilton's age when Nige joined Williams in the mid 80's ? and Lewis is the 2nd oldest on the grid. Agree with your post though. Ferrari need driver tutors to keep them both in line. I wonder if Ferrari's public placing of Vettel before Leclerc is contractual. I wonder if Vettel has defined No.1 status in his contract and him/his manager have reminded Ferrari of that. No idea if it's the reality, but such things do happen when pressure builds. I don't agree on you for the year 2007 Alonso Vs Hamilton. Both are strong and its Mclaren fault not giving priority to one driver. so they lost the championship in single point to ferrari. If you look at the Lecrec Vs Vettel, It is different scenario. Both are good driver but not strong driver like Hamilton or Alonso. There are not fighting for Championship instead there are fight between them self for points. It is ridiculous to give priority over each other in early stage of racing. It is 100% Ferrari fault instead of driver's fault. I think drivers need firm, respectful management, or bad things will happen. I like how Haas do it. I like how Stewart did it with Cevert; i.e. "It's not your time, but it will be." I wasn't so keen on Schumacher/Barrichello but I think Schumacher/Massa was just about perfect. An example of how not to do it was Alonso/Hamilton, and latterly Ricciardo/Verstappen. It isn't Leclerc's time yet, and he's still very young indeed. I'd be looking at him to lead a charge possibly next year, but it all depends on how he performs now. You can't just throw your lead driver under the bus because his young and shiny teammate has a good weekend or two.